Every customer wants value, and every supplier says that they provide value. But, when it comes time to negotiate the contract it’s all PRICE, PRICE and more about PRICE. 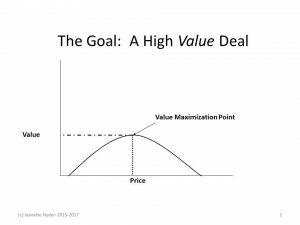 So, how do you break out of the price only conversation and really negotiate value? Negotiators need a common framework for talking about value. But, most people do not have a common framework for talking about and documenting value in a customer/supplier relationship. Without a common framework it is no wonder that when the contract comes out, everybody is focused on negotiating price. Value can be quantified, tracked and measured over time. This article will outline the types of value and how others quantified that value through some high level examples. These techniques can be and should be applied immediately to your next commercial negotiation. Companies buying services tend to make two common mistakes when it comes to determining best value. First, far too many companies still look solely at purchase price (and incur transaction costs). Second, many undervalue (or fail to recognize) the value component(s). Culture – We don’t want all of our eggs (suppliers) in one basket. Some transaction costs are necessary, and perhaps even essential. The problem is unnecessary transaction costs. When organizations incur unnecessary transaction costs, buyers spend the same dollar amount but get less value. Bidding every dollar every year just to select the same supplier is one example of a potentially unnecessary transaction cost. The time and money spent to issue, select and negotiate with an incumbent could be used to invest in the relationship. For example, if it costs each company $50,000 to go through the solicitation process, the buying company can save that money and use it in some other fashion. The supplier could make investments in people or products that could drive greater value to the customer. Value is both subjective and objective. Subjective value can feel too soft so negotiators will revert to what they know—price, which seems more firm. Objective value can be quantified, tracked and measured. It is more firm than subjective value and leads to the potential to negotiate objective value. My book, Getting to We: Negotiating Agreements for High Performing Relationships identifies four categories of value that business negotiators recognize, can quantify and care about. Decreased costs – Costs are constraints that prevent either the customer or supplier from achieving its goals. Decreasing costs are equally important to the customer and the supplier. For example, a food manufacturer decreased costs by mitigating the risk of fluctuating fuel costs decreasing risk to both companies and lowering costs to the food manufacturer. The companies agreed that the cost of fuel would be passed through to the company. The food manufacturer worked together on a daily basis to purchase fuel. Either (both) company purchased fuel at the lowest rate each could find on the open market. It did not matter which company purchased the fuel since it was cost pass through. The vendor has contractual obligations to operate efficiently. Decreased risk – A risk is the possibility that something negative will happen. The value of the risk depends on the degree of negative impact and the likelihood of the risk materializing. Continuing the example from above, the food manufacturer and vendor agreed included a contractual incentive for the vendor to be more fuel efficient. To earn the financial incentive, the vendor operated their trucks at lower speeds, idled less frequently for shorter periods of time, and used routing software. It is rather easy to identify a risk like flucuating fuel costs with your shipper. It is a little harder to identify commerical risks to decrease through the contract. Commercial risks such as warranty periods, penalties and limitations of liability add costs to perform. The risk may or may not matrialze. If the risk does not materialize both parties are satisfied, but both companies have incured costs that are not refundable. So my question to you is this: Which commerical risks can you mitigate or eleminate all togehter? This is a two-sided conversation. Not only does the customer want to mitigate or eliminate commercial risks, but so does the supplier. Another form of risk to decrease are technical risks. Technical risks are those in the technical delivery of the product or service. Rather than seeking to negotiate to reduce base costs, seek to mitigate or eliminate the technical specification risks. Increased opportunity – An opportunity is the possibility that something positive will happen. The value of the opportunity depends on the degree of positive impact and the likelihood of the opportunity materializing. For example, a financial institution that outsourced its call center operations for consumer credit card help desk operations found that high customer satisfaction scores in the help center translated into increased customer retention and increased opportunities to up sell services to the consumer. Increased benefits – A company can increase a benefit to another in a variety of ways from, improving a brand, increasing inventory turnover or generating a better response from a marketing campaign. For example, a paper mill that produced expensive, custom manufactured paper stock worked with a luxury manufacturer of consumer goods to improve their direct outreach marketing efforts. The paper mill produced a specialty paper that was used in a sample mailing. The mailing increased the response rate by nearly 1%, which was linked to an increase in sales. The paper mill won the annual contract to supply specialty paper to the luxury manufacturer of consumer goods. Getting to We: Negotiating Agreements for Highly Collaborative Relationships. Nyden, Jeanette, Vitasek, Kate and Frydlinger. Palgrave,McMillan. New York: 2013.